Wiring pigtale connector to replace a worn or damaged wire connector on trailer. This is a fixed part that does not get changed unless damaged or adding additional lights on trailers. Works with and Brite Lite 2 wire (Run/Marker) LED lights. Wiring pigtale connector to replace a worn or damaged wire connector on trailer. This is a fixed part that does not get changed unless damaged or adding additional lights on trailers. 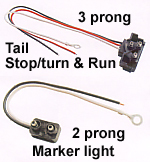 Works with and Brite Lite 3 wire (Stop/Turn/Run) LED taillights.